24′ x 36′ Garage Special! Home / Special Sales / 24′ x 36′ Garage Special! Need a little extra space. Maybe a workshop? Extra room for your boat or side by side? For less than the price of a new or used car, you can have the perfect garage to house two cars and a workshop! 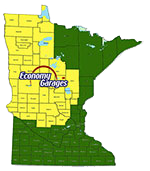 Economy Garages builds standard and custom “stick-built” garages in North Central and North Western Minnesota. We do everything from design to Site Preparation, Concrete Work and Construction.